About "Swept Away (#01 in Trouble In Texas Series)"
"Mary Connealy " " " "Mary lives on a Nebraska ranch with her husband, Ivan, and has four grown daughters: Joslyn (married to Matt), Wendy, Shelly (married to Aaron), and Katy. And she is the grandmother of two beautiful grandchildren. 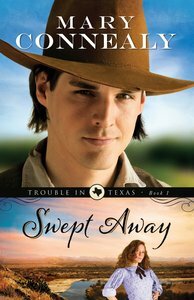 Customer Reviews For "Swept Away (#01 in Trouble In Texas Series)"
While this was a nice story, it never really gripped me. I found myself skipping pages, just wanting to get to the end to find out what happened. The story was interesting enough and the characters sweet but it didn't pull me in or make me really care about the characters or their lives. That said, if you're looking for an easy story to read and don't mind a bit of vengeancejustice (and characters singly focused on getting it), you'd probably like it. Swept Away is fast paced and well written with strong characters and a good mix of action, humour and romance. Ruthy is feisty, hard-working and independent, while Luke is the kind of loyal ad honest Wild West hero everyone wants to read about. My main complaint is that the faith elements are pretty unobtrusive. My personal view is that this is a weakness, but I know some readers prefer low-key Christian content. Swept Away is a quick and entertaining read, perfect for long winter evenings or a day at the beach. It was good, but not outstanding. I thought the whole story (especially the attraction between Ruthy and Luke) moved too quickly and wasn't quite believable, but it will be interesting to see it develop further in future books. I also thought it focused too much on the external conflict, with too little insight into the inner motivations of the characters. It is the first book in the new Trouble in Texas series, and those who have read and enjoyed Mary Connealy's earlier books will notice the references to Callie and the Kincaid Brides trilogy. I expect the future books in the series will chronicle the adventures and romances of the other four Regulators.